Cincinnati Opera and CCM Opera are pleased to announce the establishment of a new joint venture, Opera Fusion: New Works, a program designed to support the development of new American operas. Click here to visit Cincinnati Opera’s website and read the official press release. Click here to read Janelle Gelfand’s article that details this exciting joint venture between Cincinnati Opera and CCM Opera. Opera Fusion: New Works builds on an established and successful four-year partnership between Cincinnati Opera and CCM Opera. In 2007, Cincinnati Opera and CCM Opera launched The Corbett Foundation Opera Fusion program, created to promote and enhance young artist training opportunities, collaborative academic programming, internships, and an ongoing artistic relationship between the organizations. Opera Fusion: New Works, which is funded entirely by The Andrew W. Mellon Foundation, allows this existing relationship to expand into new areas. Opera Fusion: New Works will be jointly administered by representatives from each of the collaborating organizations. Marcus Küchle, Director of Artistic Operations of Cincinnati Opera, and Robin Guarino, J. Ralph Corbett Chair of CCM Opera, will act as co-artistic directors for the program. • Janelle Gelfand, of the Cincinnati Enquirer wrote a review about the competition on her Arts in Focus blog. Click here for the article. • The 2011 CCM Opera Scholarship competition was also reviewed by Rafael de Acha, one of the many correspondents from ConcertoNet.com. If you were not able to attend last weekend’s exciting competition, you can read Rafael’s account by clicking here. 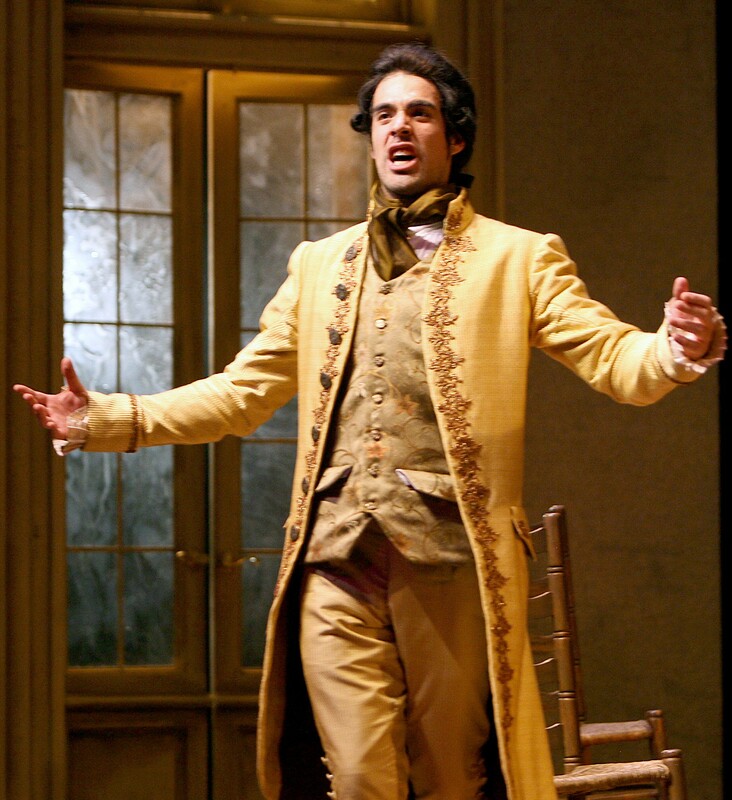 Mozart’s “The Marriage of Figaro” has been called the perfect comic opera. At its most basic, it is a witty bedroom farce of misplaced kisses, intercepted letters and mistaken identities involving a Count with a wandering eye and his houseful of clever servants. But beneath the surface, “Figaro” is also one of the most profound achievements of Mozart and his librettist Lorenzo Da Ponte. There are issues of class struggle, as well as real love and forgiveness. The opera provides not only a rollicking night of theater, but also beautiful melodies, glorious ensembles and ravishing arias such as the Countess’ despairing and luminous “Dove sono.” It’s a staple of major opera houses. So it was refreshing to see the youthful interpretation presented Friday night by the promising opera students at the University of Cincinnati’s College-Conservatory of Music, in the intimate surroundings of Patricia Corbett Theater. Robin Guarino, chair of the opera department. And because “Figaro” is an ensemble opera, it was ideal for this young cast consisting of uniformly fine voices and several standouts, who impressed Friday’s sold-out audience. (The production has two different casts.) The upstairs-downstairs plot involves the impending wedding of the servants Figaro (Noel Bouley) and Susanna (Xi Wang). The philandering Count (Luis Alejandro Orozco) has designs on Susanna, to the distress of the Countess (Meghan Tarkington). She enlists the help of the servantsand the page, Cherubino (Audrey Walstrom), to teach the Count a lesson. Thomas Umfrid’s set design – high walls with tall windows, which seamlessly changed from indoors to outdoors — beautifully captured the faded luster of the aristocratic villa. The garden scene, which is often a hodge-podge of figures in the dark, was magical. A spectacular tree with hanging lanterns descended and centered the stage, with a black, fiber-optic curtain simulating twinkling stars as a backdrop. Mozart’s witty ensembles included fine performances in secondary roles: Jill Phillips portrayal of Marcellina was funny and Thomas Richards was fine as Bartolo. Ian Jose Ramirez played Basilio as an annoying musician Rounding out the cast, Sakinah A. Davis made a charming Barbarina, and Dashiell Waterbury was fine as Don Curzio. Guarino made the entrance of the gardener (Timothy J. Bruno) very funny. The chorus of peasants performed well and added life to the stage. It was only in the orchestra pit that we were reminded these were students. In fact, the musicians were all undergraduates. There were a few rough edges in the strings, and times when stage and pit were not quite together. Still, the overture bristled with energy, and throughout the evening, the winds and brass were quite good. The atmospheric, light accompaniment to Cherubino’s “Voi che sapete” was lovely. Conductor Annunziata Tomaro led persuasively, and her tempos propelled the music well. Something unusual is taking place behind the scenes in the production of Mozart’s “The Marriage of Figaro,” running through Sunday in Patricia Corbett Theater at the University of Cincinnati’s College-Conservatory of Music. The conductors, director, master coach, stage manager and the production head are all women. In addition, women are taking charge backstage in costumes, wigs and makeup, props, and even choreographing fight scenes. 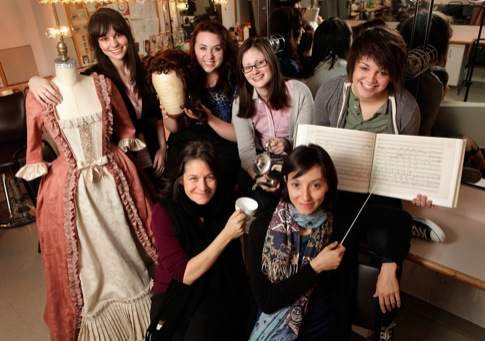 In all, 10 women are working in leadership roles behind the scenes of “Figaro.” (That doesn’t count two women performing as concertmaster, and two others on fortepiano). Women are slowly making strides in classical music, taking on roles that, throughout history, traditionally went to men – such as the conductor, opera director and concertmaster of the orchestra. Mozart’s opera, based on a French comedy by Beaumarchais, takes place on a single day of madness in the palace of Count Almaviva, as the French Revolution is brewing. We spoke to “Figaro” director Robin Guarino, who holds the J. Ralph Corbett Distinguished Chair in Opera at CCM, and to conductor and faculty member Annunziata Tomaro, who was awarded an “outstanding woman conductor” grant by the League of American Orchestras in 2010. Question: How did you happen to have so many women in prominent roles behind the scenes in “Figaro”? Guarino: We didn’t do it intentionally. But it really is interesting. I think it happens here at CCM because we have strong female role models. We’re coming from the highest levels of the profession, and we really love to teach, but also love to mentor. 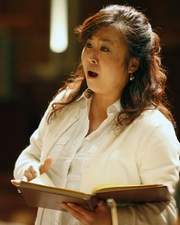 That’s the case with Annunziata, who has mentored Huan Jing (who will conduct one performance). Then we have Marie-France LeFebvre, who’s the master coach. I met her at the Metropolitan Opera, when she was the assistant conductor for “Figaro” at the Met, and I directed it. Then you have Michele Kay, head of production and the chair of the theater department. All of a sudden, you have all these women in key positions who are very much supporting the advancement and nurturing of women. Q: How tough is it for women to succeed at the top in classical music? Guarino: As a woman, it is so competitive that you have to walk in the room and know that you’re going to be better than everyone in the room. Just to succeed as a concertmaster, as a woman conductor, as a woman director – you have to be up on your game, and you have to master your material. You have to be better. That’s what I think is happening. Women are getting stronger and feeling more confident. Tomaro: Certainly, the world, in part, is more open and willing to see women in roles they haven’t seen before. But those expectations are perhaps different or greater. So the possibility is there, but the process of achieving is still challenging. Q: Why is “The Marriage of Figaro” sometimes called the most perfect opera? Tomaro: It is such a gem. It has perfect arias. It has perfect ensembles. The Second Act finale has to be the highest representation of that form. It was so common for the midpoint of the opera to have the high-point of confusion, and (Mozart) mastered that. Q: Looking at the women of “Figaro,” how do you see the character of Susanna, the maid? Guarino: Everyone loves her because she’s always working, always thinking, kind and generous. She’s the perfect partner for Figaro. They haven’t had formal education and the benefits of class and aristocracy, but they are loved by people from all classes. Their very liberty and independence and their spirit – we’re on the edge of the whole world exploding in the French Revolution. Those are the risks right now, and you want to root for them all. And Susanna is the heart of that couple. Q: What’s the most challenging for the conductor? Tomaro: What’s hard in general about Mozart opera is finding the right tempi that work for the dramatic action, but also for the style of the music and the types of singers who are singing. You need to find the right transparency, but also the energy, as well. That’s a challenge and always shifting and dependent on the situation. Q: Thomas Umfrid’s set designs are beautiful. What were you trying to achieve? Guarino: I wanted it to be realistic in architecture and feeling and in period, but very human. … It has the aristocratic scale of the villa, but you feel that its time has passed, the paint is crackling, and there’s a little bit of disrepair. You’ll look at the set and say, “Oh, that’s the Countess’ room.” It’s about human beings, in a situation, in a time of life, in a time of history that is about to erupt. And it is about basic core human rights and values. We wanted that humanity to come out. Can CCM stay a jewel? Mezzo-soprano Audrey Walstrom of Los Alamos, N.M., could have gone anywhere in the country to study voice. But she chose the University of Cincinnati’s College-Conservatory of Music. “It has an excellent reputation in the voice world because the teachers are excellent,” said Walstrom, 26. “For me, it just felt like a great fit.” Attracting students such as Walstrom, who’s working on a graduate degree, is a key to CCM’s future as one of the premier music schools in the country. CCM helps to put this region in the cultural big leagues. It has connections to both the community and the broader world – from the Preparatory Department where parents take their children for piano, ballet or acting lessons, to its graduates who star on the world’s greatest stages. Audiences can see an astonishing 1,000 performances at CCM each year, many of them free. Locally, CCM offers an incredible pool of talent – not only conductors, musicians, dancers, composers and music teachers, but also executives running important media outlets, such as the CEO of Cumulus Radio Group, which operates five stations in Cincinnati. But keeping CCM among the elite won’t be easy. UC is bracing for budget cuts of up to 20 percent next year, which would restrict the classes it can offer, the professors it can attract and the students it can lure with scholarships. CCM also is strapped with a $4.9 million loan it must pay off for its new fleet of Steinway pianos. The college is under particular pressure because it depends on private donations to fund scholarships for students choosing among the nation’s top music schools. If it’s forced to cut the nearly $15 million it pays out in scholarships each year, many of those most talented students will go elsewhere. CCM leaders know that raising more money to fund more scholarships is the best path to remaining elite. Meanwhile, department chairs are going through budgets to determine where they can make worst-case scenario cuts. “It’s getting to the critical point,” interim Dean Frank Weinstock said. “For CCM to stay where it is, private funds are going to become more and more necessary. Scholarship dollars are paramount. We just need more.” UC’s top officials have pledged to try to protect CCM and other high-profile programs in budget talks this spring and to keep funneling money to scholarships. “I know it’s a jewel at UC,” said the university’s new provost, Santa Ono, who played cello and piano as a child in the Preparatory Division of the Peabody Conservatory of Music in Baltimore. “It’s one of our key assets. I’m committed to doing everything I can to protect that position nationally. I haven’t made a final decision, but I’ve made it very clear that I won’t do something simple-minded like across-the-board cuts.” Ono has launched a search for a new CCM dean. The creative vitality of CCM’s graduates is the currency it carries into the marketplace, but that’s a hard thing to measure in dollars. CCM’s assets are considerable. It occupies a $93.2 million complex on UC’s main campus and welcomed a record enrollment of 1,468 students this year. David Arevalo, a costume technician at CCM, adjusts a costume that Luis Orozco will wear in "The Marriage of Figaro." Orozco, a master's student in voice performance, plays Count Almaviva. Soprano Xi Wang, a student at the University of Cincinnati’s College-Conservatory of Music, remembers standing on the stage of the Metropolitan Opera in New York two years ago, when she was a national semifinalist in the National Council Auditions. “Being on that stage at age 25, I thought, ‘Oh my God, I have already fulfilled my dream.’ The stage was so huge, but you could hear a penny drop,” the singer says. “Even though I didn’t advance to the finals, I felt so grateful, so lucky to be that far.” Wang sings the role of Liù in a concert presentation of Puccini’s “Turandot” Friday and Saturday in Corbett Auditorium at CCM. Click here to read this article in it’s entirety at The Cincinnati Enquirer’s website. The opera department at the University of Cincinnati College-Conservatory of Music received a total of 7 awards at the National Opera Association annual convention in San Antonio over the weekend. The association awarded four of CCM’s Mainstage and Studio Series of operas from the 2009-10 season some of its highest honors. In addition to the 4 top awards noted in The Enquirer article, the department received two awards in Level 11 — “Opera d’Arte” undergraduate opera productions. “La Canterina” took second place (Wesley Lawrence, director) and “Gianni Schicchi” took third place (Kenneth Shaw, director). Click here to read Janelle Gelfand’s full story on the Cincinnati Enquirer’s Webpage.